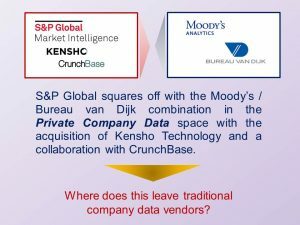 S&P Global (NYSE: SPGI) announced today that the Company has hit an exciting milestone in an alternative data linking project in collaboration with Kensho Technologies Inc. (“Kensho”), acquired by SPGI in April, and Crunchbase, a well-known destination for data on some the world’s most innovative companies. 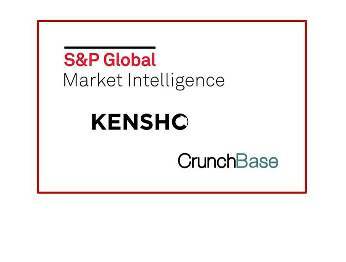 Leve raging Kensho’s machine learning algorithms, S&P Global Market Intelligence platform users can now access robust information on privately held companies licensed from Crunchbase. By leveraging Crunchbase data, coupled with Kensho’s machine learning algorithms, S&P Global’s ability to provide expedited insights is particularly valuable for companies at the venture stage, allowing for greater accuracy in making informed investment decisions or for those organizations interested in acquiring or investing in these private companies. About Kensho Technologies Inc.: Kensho is an award-winning machine intelligence company founded out of Harvard University in 2013. Kensho’s early team members came from veteran roles at Google, as well as from academia. Kensho applies AI for real-world impact across government and commercial institutions around the world. For more information, visit www.kensho.com. About S&P Global Market Intelligence: At S&P Global Market Intelligence, we know that not all information is important—some of it is vital. We integrate financial and industry data, research and news into tools that help track performance, generate alpha, identify investment ideas, understand competitive and industry dynamics, perform valuations and assess credit risk. Investment professionals, government agencies, corporations and universities globally can gain the intelligence essential to making business and financial decisions with conviction. About Crunchbase: At Crunchbase we believe that your decisions deserve the best data. Crunchbase is the leading destination for millions of users to discover industry trends, investments, and news about global companies—from startups to the Fortune 1000. Crunchbase is about more than just data – it’s about community. Crunchbase was founded to be the master record of data on the world’s most innovative companies. We built a unique and scalable approach to data collection leveraging a strong community of contributors, the largest venture partner network, and in-house data teams armed with powerful machine learning. Thanks to an amazing (and growing!) team, we’re creating the single source of business intelligence.